Injuries happen, especially to kids. Bumps & bruises, broken arms, sprained wrists & jammed fingers are all a part of life. They also make it hard to play the piano, or do they? 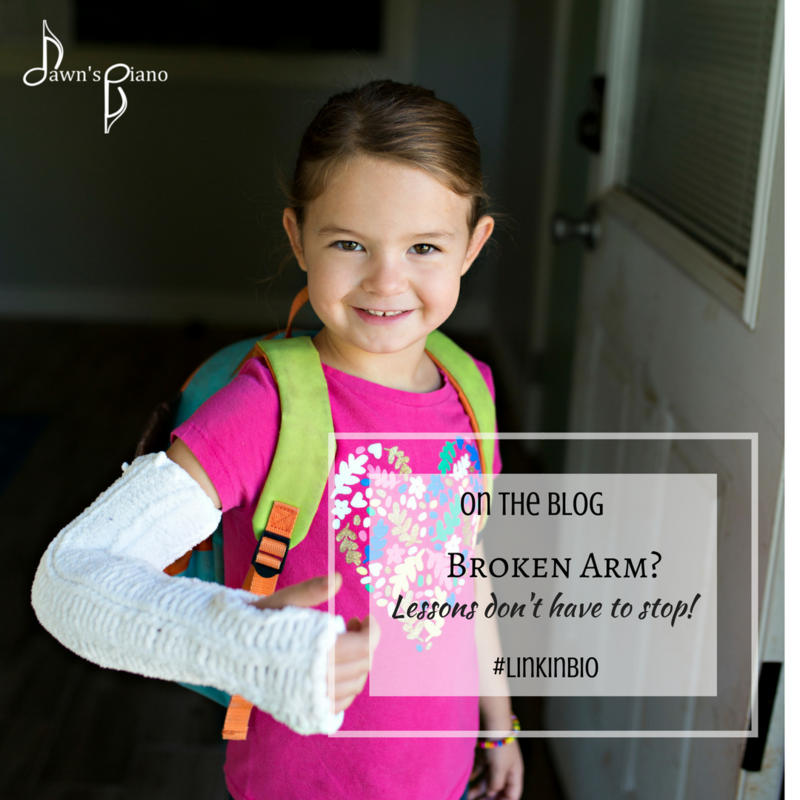 This post is all about why I continue lessons even when a student has an injury preventing one hand from being able to play. You are probably wondering, but how can a student still benefit from lessons if they can only play with one hand? Sight Reading - All piano students should be practicing sight reading regularly. Most do it intermittently, or only when the teacher tells them to in lessons. Using this time to improve on a student's sight reading skills can be so beneficial! One-Handed Solos & Technic - Did you know that there's a lot of one-handed music out there at all levels? Several well-known classical composers actually wrote one-handed pieces as technical exercises or for one-handed pianists. Improvisation - Use your knowledge of scales, chords & how they work together to build your improvisation skills. We can learn how to read Lead Sheets & Chord Charts and enhance your piano kid's creative playing. Music Theory - Because of time restraints, I typically incorporate music theory into regular lessons through short games & homework assignments. But we can always afford to bring this a little more front-and-center into our regular lesson time. Resting an injury provides a great opportunity to reinforce some music theory. Composing - Put together melodies or chord progressions, try your hand at notating sheet music, use the tools you've learned to try something a little new & different with your music and stretch your creative muscle. Duets - Playing duets builds a students ear for playing with other musicians & improves their awareness of musical timing, flow & dynamic range. And you really only need one hand! Rhythm - Rhythm reading is another component of sight reading that can be worked on as long as you can tap a beat or play a drum, and it's another one of those areas that tends to get pushed into a few minutes at the end of a typical lesson. Pedaling - You only need one hand & a working right foot to work on good pedaling technic! Momentum & Consistency - The consistency of weekly lessons builds momentum in a student's progress because it keeps the musical concepts fresh. If you break an arm and take 6 weeks off and don't look at a single piece of music, that will put a huge hole in your momentum and the first few weeks back will inevitably be review to try & catch up with what you knew before the break. And all this is why I still encourage lessons when there's been an injury to an arm, wrist or finger. There is so much we can continue to cover, or to bring to the center of our attention for a few weeks before we bring back the 2-handed coordination aspect of lessons. As always, any questions, please feel free to let me know!